A recent paper by Lokman Tsui , a professor at the School of Journalism and Communication of the Chinese University of Hong Kong and longtime member of Global Voices, offers a chilling look at how authorities in Hong Kong outdid their rivals during the 79-day Occupy Central movement that hit the city in late 2014. Thousands of protesters set up camp in downtown Hong Kong  in September of last year to demand the freedom to choose candidates in the city's first direct vote of its chief executive in 2017. China has held that anyone vying for the top position in Hong Kong, a special administrative region with a certain degree of autonomy from the mainland, must get majority support from a nominating committee stacked with pro-Beijing members. 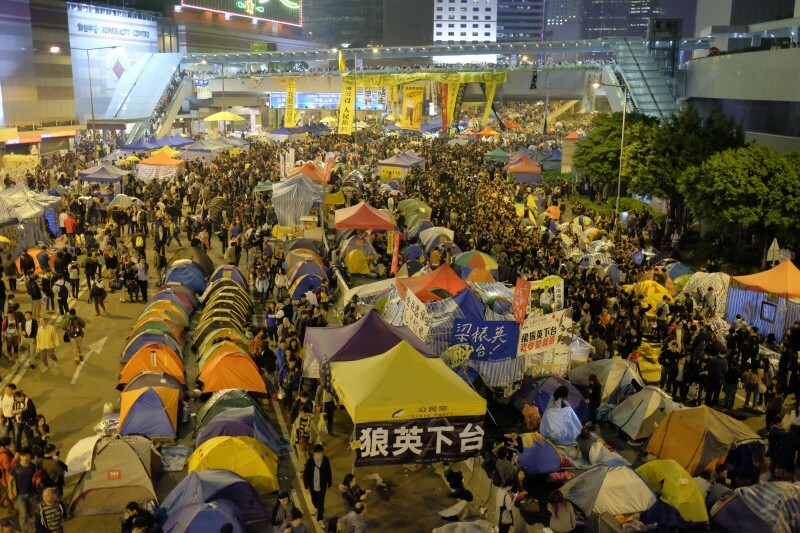 The Occupy movement braved police violence as well as political pressure and intimidation on and offline from Hong Kong and mainland Chinese authorities before being driven out by authorities. Technology played an important role in the movement's organization and coordination, becoming “a critical channel for communication with the public,” according to Tsui. He described this as “a fairly typical script” for how technology aids social movements. In response, the government not only defended itself but, as Tsui states, went on the offensive. His paper describes the various tactics deployed by the government and its allies to dissuade and diminish the Occupy movement. The current surveillance regulation ordinance only refers to telephone, fax and postal mail, and makes no mention of Internet communications. By repeatedly refusing to confirm whether its protections extend online, the government is implying that there are none. Pro-government comments flooded online forums, blogs and social media networks similar to the paid online commentators working for the government elsewhere. It is generally believed that the pro-government commentators are hired by political groups sponsored by the Hong Kong government and Beijing. The Internet still has the potential to empower social movements; they might even allow temporary gaps of freedom. But the [Occupy Hong Kong] movement suggests that both the Internet and Hong Kong are at a crossroads, that both cannot take its freedoms for granted. This is not to say that spaces of autonomy and freedom no longer exist online or in Hong Kong; however, they are increasingly being marginalized and, at this point in time, are best understood as the exceptions rather than the norm.